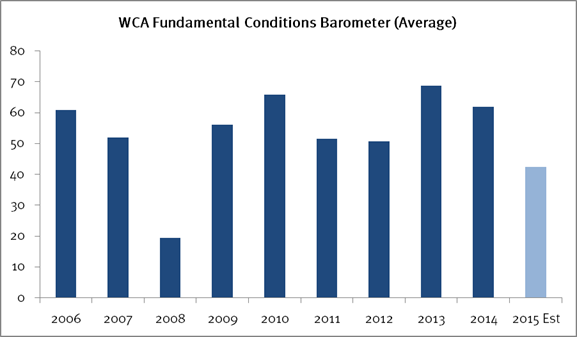 The WCA Fundamental Conditions Barometer remains weak reflecting slower global growth. Our updated forecast has the barometer tracking toward 43 for October and remaining in the 40-45 range for the fourth quarter of the year. The bright spot remains domestic final demand which continues to plow forward on steady improvement in employment and wages. 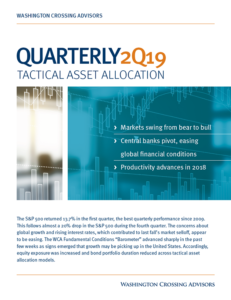 The pickup we saw from the second quarter is not continuing into the third quarter and both the IMF and the Atlanta Fed’s GDP Now forecast are being trimmed. The IMF again revised its global growth rate down to an estimated 3.1% for 2015 and the Atlanta Fed is now targeting a sub-1% U.S. GDP growth rate for the third quarter. The slow pace of growth is consistent with our barometer’s readings throughout the year (below). If our forecast turns out to be correct, 2015 will be the weakest since 2008 as our barometer is currently expected to average near 43 for the full year (below). Third quarter earnings are also being impacted by weaker global growth. 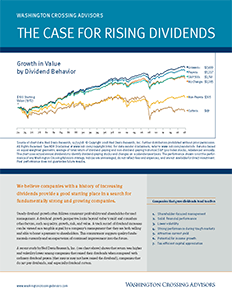 Margins are expected to decrease during the back half of 2015 from near-record levels. The net profit margin for the S&P 500 is now expected to decline to 10% and 10.2% for Q3 and Q4 2015 (10-year average net margin is 8.7%). At the same time, the forward multiple for the S&P 500 is at 16x compared to a 10-year average of 14.1x, according to FactSet. Large declines in energy and basic materials are weighing on results and the stronger dollar, coupled with some increased wage pressure, are weighing on profitability. The drop in energy prices for energy consuming industries has not been sufficient to offset the drag from weaker emerging market economies and commodity prices. The forward 12-month earnings estimate for the S&P 500 is trending sideways and now stands near $125. By this measure, there has been no meaningful improvement in the overall earnings picture since early 2014. Additionally, markets have been reluctant to price in multiple expansion in the face of slower growth and eventual Fed tightening.